BIG SALE!! SPUN GLASS DRAGONS BIG SALE!! Outstanding gold accented Chinese Dragon with red crystal eyes. The Dragon with Pearl is an ancient and powerful Feng Shui symbol directing prosperity, wisdom and good fortune to the individual or enterprise. A majestic Sapphire Blue Horned Glass Dragon has dramatic gold accented frosted wings and ruby crystal eyes. He is poised on an oval glass beveled mirror base which can be illuminated from below with a light base. 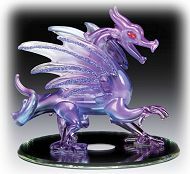 A gorgeous spun glass Opalescent Purple Glitter Dragon has ruby crystal eyes and glitter laden wings as he stands on an oval glass beveled mirror base which can be illuminated from below with a light base. Each hand made dragon figurine comes packed in a glossy gift box. Iridescent Red winged Dragon with amber underbelly guards a three tower castle and pearled magic crystals set on a beveled round mirror base. He has purple crystal eyes with gold trimmed horns, claws and wings. 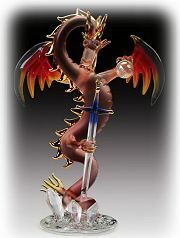 Each hand made, spun glass dragon figurine comes packed in a gift box. Tall spread winged, fire hued Red Dragon with gold hued underbelly is poised to strike. 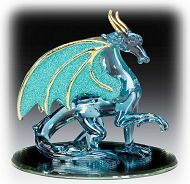 This large glass dragon is set on a beveled round mirror base, he has blue crystal eyes and gold trimmed horns. 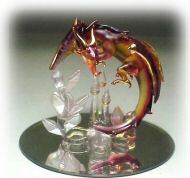 Another splendid glass dragon to add to your collection. Delicate and stunning frosted and clear European facet crystal Winged Dragon with ruby crystal eyes and long frosted crystal tail. 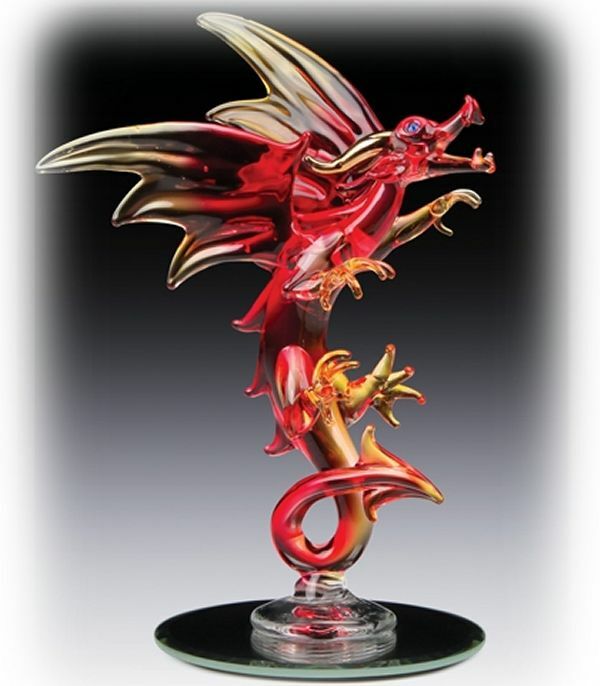 High quality imported leaded crystal sculpture is hand crafted and gift boxed. Gorgeous spun glass Flame Winged Dragon holds a blue hilt clear glass sword and crystal ball as he protects his magic crystals on a beveled glass base. He has ruby crystal eyes, gold accented scales, horns and claws. 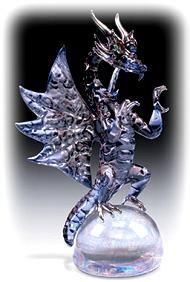 Each hand spun glass dragon figurine is gift boxed and can be placed on a light base for added pizzazz! 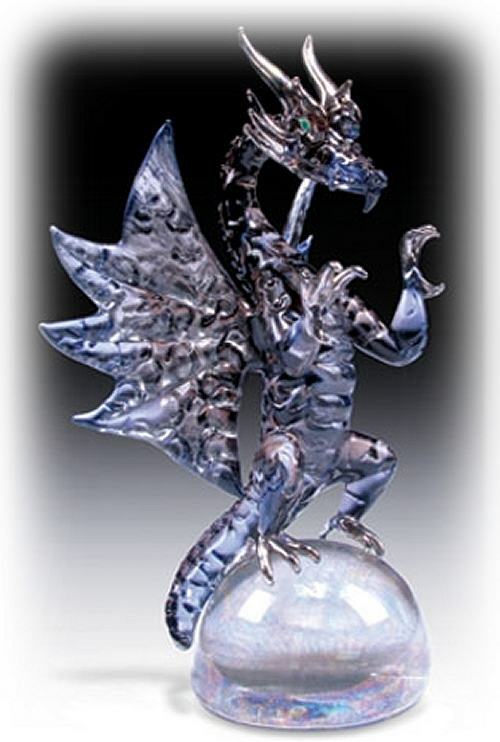 Exquisitely, beautiful transparent smoked Sapphire Dragon with striated wings and ruby crystal eyes is perched on a highly reflective glass dome. He has shiny silver horns and claws ready to attack. A wonderful Feng Shui accessory combining the beneficial properties of the ancient dragon symbol with the Chi energy of the the reflective glass dome.